We thought we’d round out Around the World Week here with a little taste bud trip to the tropics — Jamaica, mon! Courtesy of the Caribbean Shopping Channel (special thanks for the time-saving tips! 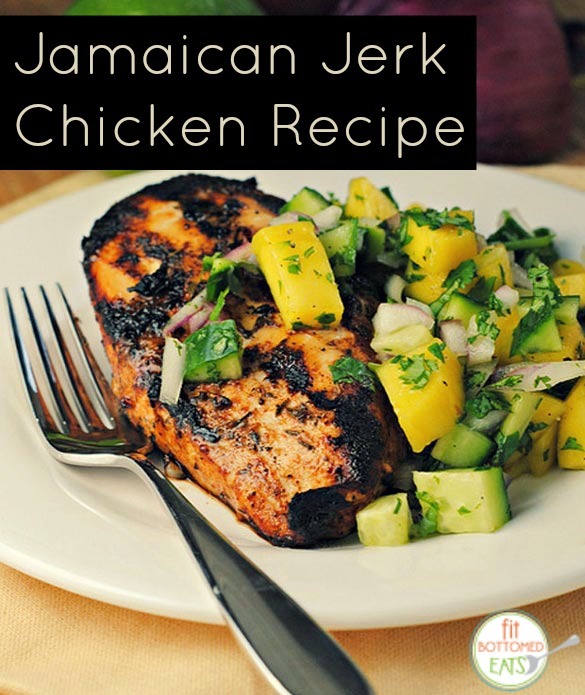 ), this Jamaican jerk chicken recipe not only packs some awesome flavor while still being healthy, but it’s also a pretty simple dish to make. So a culinary trip to the Caribbean? Coming right up! 1. Cut legs at the joints. 3. Add chicken to bag. Seal bag and shake to coat chicken. Refrigerate for 3-4 hours. 4. Drain and discard marinade. 5. Lightly coat grill rack with oil. (Don’t have a grill? Grilling is one of the healthiest ways to cook chicken. You don’t need a hefty gas grill to do the job; check out this portable, cost effective charcoal gas grill: Cusinart 14” Grill.) Grill chicken, covered, on medium heat for 40 minutes or until thermometer reads 180 degrees, turning over every 10 to 15 minutes. 1. In a large serving bowl, whisk vinegar, lime juice, salt and pepper to taste. Slowly mix in oil. Toss in mangoes, avocados, onion and cilantro. 2. Serve on top of cool chicken, or as a side dish.